In October 1860, at the culmination of the Second Opium War, British and French troops looted, and then burnt, the imperial buildings in the Yuanmin­gyuan (or ‘Summer Palace’) in the north of Beijing. Over a million imperial ob­jects are estimated to have been taken from the site: many of these are now scattered around the world, in private collections and public museums. 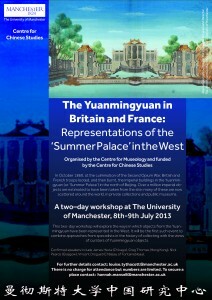 This two–day workshop at The University of Manchester, 8th-9th July 2013, will explore the ways in which objects from the Yuan­mingyuan have been represented in the West. 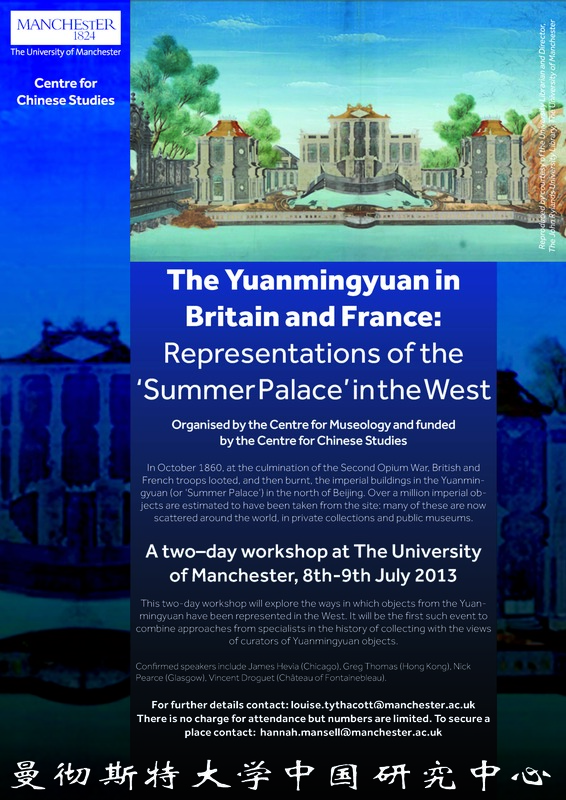 It will be the first such event to combine approaches from specialists in the history of collecting with the views of curators of Yuanmingyuan objects. Confirmed speakers include James Hevia (Chicago), Greg Thomas (Hong Kong), Nick Pearce (Glasgow), Vincent Droguet (Château of Fontainebleau).